Smartswitch represent itself as a superstructure (additional modules) over Asterisk PBX and uses its capabilities to perform actions on a channel and to bridge signaling sessions and media streams. Why Asterisk was chosen as a telephony core engine? Although currently big amount of open-source telephony solutions exist, we've chosen Asterisk project as basis for our product. Asterisk is a big, constantly developed project, which is contributed both by the professional team and the community. This ensures its quick perfection. Asterisk functionality covers everything, that any telephony solution might need. During operation, Smartswitch uses MySQL database to store configuration and call data reports (cdr). 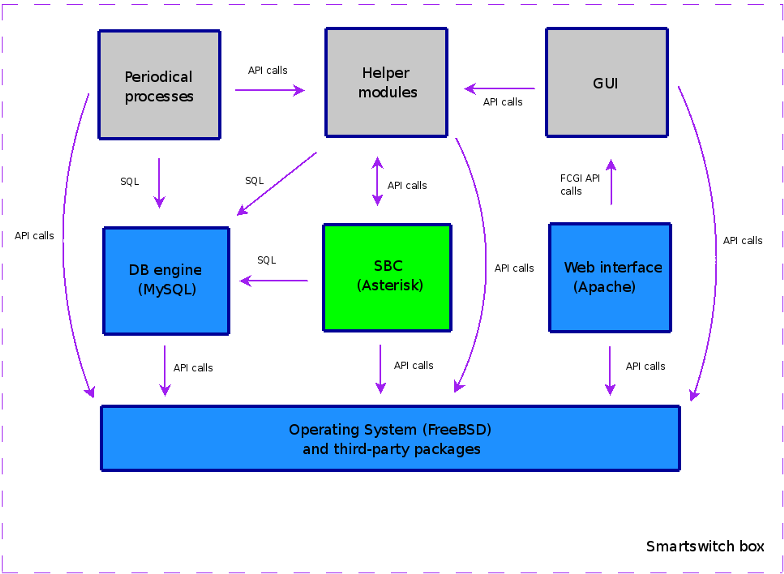 Why was the MySQL database engine chosen? Currently it is the fastest and the easiest in service open-source database system. Its clustering and replication capabilities make possible to implement High Availability solutions with our product. Items marked gray are developed by Streamco from scratch. Items marked green are patched open-source components. Items marked blue are original open-source components. Configuring the system and viewing the reports using web interface. Call processing according the current configuration by telephony core and billing the released calls.